One of the first concerns, when someone thinks about having a baby, is all of those diapers (there are going to be a lot!). The earlier you start building your diaper stockpile the better. I started as soon as we decided we were going to try to get pregnant. 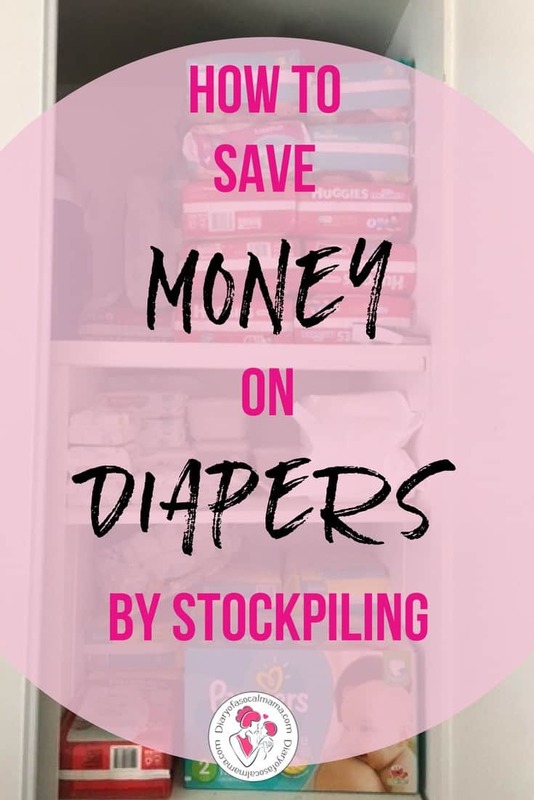 Today I’m sharing all my secrets to building a giant diaper stockpile and saving as much money as possible. My daughter was over a year old before she caught up with our stockpile! This post contains affiliate links but all tricks and diaper stockpiles are my own. If you make a purchase after clicking one of my links I may earn a commission at no additional cost to you. Now I love Amazon and I know a lot of people swear by the Amazon subscription service, and that works great if you want a set it and forget it, but you won’t always get the best deals. 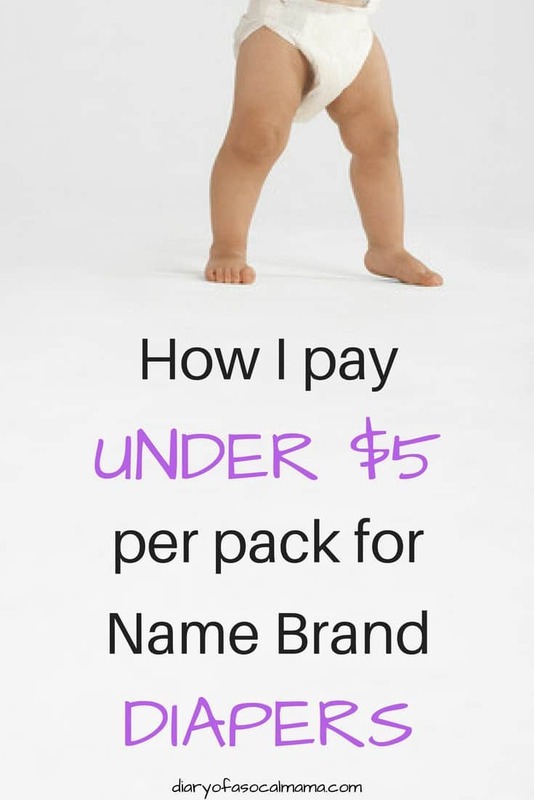 I prefer to use the tried and true methods outlined below to get my average cost of a diaper pack below $5. I used the counts from The Suburban Mom for mine and so far it’s working well. I would hold off on buying newborn diapers, especially if you plan to have a baby shower. People will often gift you newborn and perhaps some size 1 at your shower. You also don’t know how big your baby will be, they may barely wear any newborn diapers depending on how large of a baby you have. Have a couple packs on hand and that’s it. Bonus Tip: Make sure you have the nurses at the hospital refill the diapers during your stay, this way you’ll be able to go home with several packs of newborn diapers. I went with Pampers and Huggies, mainly Pampers. I’d heard decent things and they are frequently on sale. I’m definitely more of a Pampers fan now that I’m almost a year in. My daughter reacted to some types of Huggies and I had to exchange some packs. I’ve also used Parent’s Choice from Walmart but I found them to be far less absorbent than the Pampers. Pampers also has a great reward program! If you scan codes inside of bags and boxes of diapers and wipes as well, you’ll build up points. You simply scan the code on an app you download to your smartphone. The points can then be exchanged for baby items or coupons for future purposes. I usually redeem mine for $5 coupons could on a future pampers diaper purchase. The big boxes are tempting but the jumbo packs are where it’s at to get the best price per diaper. I personally buy mine at CVS, but other drugstores such as Rite Aid and Walgreens often have similar deals. Every few weeks they run a deal where you spend $30 on certain items and you receive $10 back in Extracare Bucks. You only have to get 98% of the way there to trigger the deal so don’t worry if you are just a little bit short. The diapers will generally be on sale as well so you will likely be picking up 3 or 4 packages at a time. Be sure to check your local newspaper for coupons or go to coupons.com. You can print 2 coupons per device so you may need to use more than one device so you will have one coupon per pack of diapers or one per 2 packs depending on the coupon guidelines. Coupons are also available at PGeveryday.com for Pampers coupons and pickupthevalues.com if you are looking for Huggies coupons. Pay for the deal and ensure you get your Extracare Bucks back. These bucks are generally good for about 3 weeks, be sure to check the use by date. Save these bucks and use them to do the same deal again a couple weeks later and you are on your way to building your stockpile. Once you start buying diapers on a regular basis you will also get special coupons or deals at CVS. Be sure to download the CVS app and check every Sunday morning for new deals. You should end up paying $4-5 per pack, maybe even less for your diaper stockpile. Check out the video below for an example of a recent deal I did at CVS! Want to save even more? Sign up for Swagbucks. Earn points and redeem for a CVS gift card or buy a gift card on MyGiftCardsPlus through Swagbucks and you’ll get points for purchasing the gift card, it’s like buying the gift card for a discount. You can also check Raise.com and purchase a gift card at a discount. Repeat these deals many times and soon you’ll have a stockpile like this! I hope these tricks help you save money on diapers and build a giant diaper stockpile like they have for me! If you have questions drop them in the comments and I’ll be happy to help.